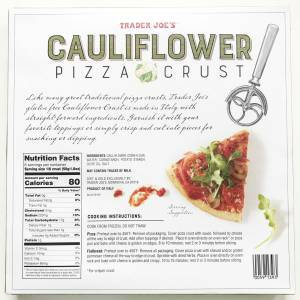 Well, we get a little help from Trader Joe’s with their new Cauliflower Pizza Crust. This is a crust that makes eating pizza a delight and an acceptable treat, without time-consuming prep. It’s something that is a must-have in your freezer at all times so that when you get the urge to dial up Domino’s pizza, you’ll remember that you can have a great pizza with all of your favorite toppings, in just 25 minutes. That’s less time than it takes for a pizza to be delivered and oh so much better for you and tastier! And you’ll actually still feel good, not like you just ate a belly bomb once you’re done with your indulgence. Favorite pizza toppings vary with each individual but below are what I like to use and what you’re seeing pictured on the pizza below. I recommend preparing what you want to use while the crust is cooking. Remove packaging from crust (save the disk and box it came in for later-see below). Place crust upside down on a sheet of parchment paper. Place the parchment paper, with pizza crust, directly on an oven rack. Broil for 5 minutes. Carefully remove crust from the oven, and flip it over (see hint below). Lightly brush the top of the crust with olive oil and dust with ¼ tsp garlic powder and 2 tablespoons of Parmesan cheese and bake for another 10 minutes. Again, carefully remove the crust from the oven to top with your toppings. I like to sprinkle a bit more Parmesan cheese on last. 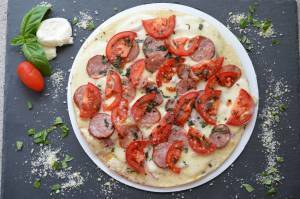 Return the pizza to the oven and cook for another 3 minutes or until the cheese is melted. Remove and allow the pizza to cool for a few minutes before cutting into slices. HINTS: I found the cardboard pizza disk included in the packaging coming in handy to flip the pizza and to remove the pizza from the oven. I just scooted the crust from the rack onto the pizza disk. When I flipped the crust, I held my hand over the top of the pizza crust as I flipped it back over onto the parchment paper. A closer look at the ingredients of the crust: Cauliflower, corn flour, a little corn starch, potato starch (which adds lightness, feeds our good bacteria and helps stabilize blood sugar), olive oil, salt. Being able to pronounce all of the ingredients is always a good thing. The fact that this has corn flour and starch in it makes it non-paleo friendly food but these two ingredients hold the crust together and add a little crispness. In a perfect world, it would be organic corn flour and starch, but alas. All in all this is a pretty clean product and I’m very happy that TJ’s came up with this little gem. I would love to hear about your favorite toppings and your variation on how you prepared the crust.